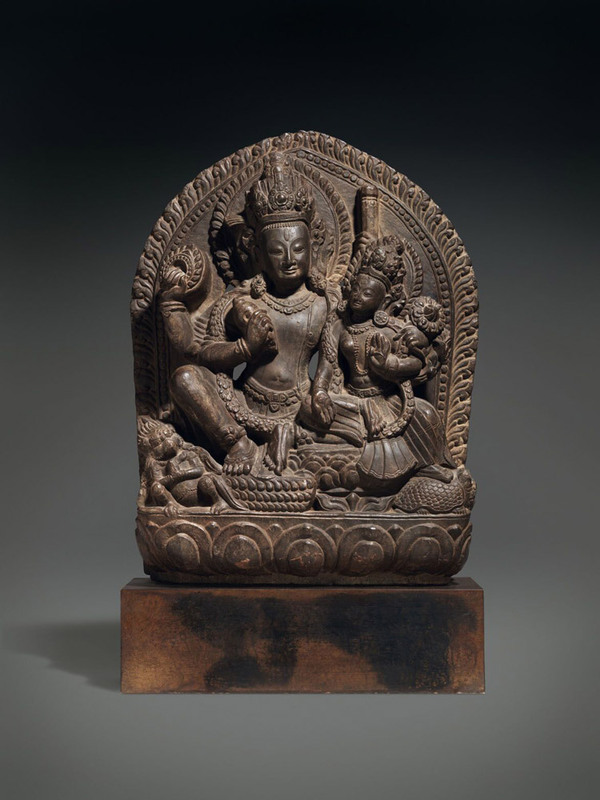 Śiva and his wife Umā are one of the main topics of śaiva iconography (Umāmaheśvara), mainly in Nepal where the widely-propagated theme is enriched by numerous secondary characters. In India obviously, but also in the Kathmandu Valley, the two other major gods of Hinduism are represented as a couple, as Viṣṇu here. In his multiple arms, the god holds his usual attributes. Starting from the first right hand, andn moving in an auspicious direction, they successively are the conch shell (śaṅkha), the wheel (cakra) and the mace (gadā). With his fourth hand, Vishnu embraces his consort. Note that these attributes aren’t distributed in the usual way; the iconography of the“hypostasis” faith, a doctrine widespread in Nepal (Vyūha) and propagated by the Pāṅcarātra sect, multiplies the secondary forms of Viṣṇu, which differ one from the other by the order of the traditional attributes only. Tenderly leaning on her husband’s chest, the goddess makes the gift-giving gesture with her right hand, held in front of her breasts in a peace-inspiring gesture, and holds the end of a lotus (padma) whose flower blossom opens up at shoulder height. The god’s feet rest on a wicker stool while the goddess is seated on a lotus. At the bottom, on the sides, are the divine couple’s steeds. Although the semi-anthropomorphic bird of prey Garuda is immediately recognizable, the goddess is paradoxically associated with a turtle (kurma). The turtle is the vehicle of the goddess Yamunā the personification of one of the two largest rivers of northern India. Its presence here with the god is not justified and there is no doubt about the identification of the goddess as Devī or Śrī, the usual consort of Viṣṇu. In mythology Garuda is associated with a turtle called vibhāvasu that he fished out of Lake Ālamba before devouring it (Mallmann, 1963, p. 266). As for Yamunā, she is sometimes associated with Śiva but not with Viṣṇu as the goddess Gangā might be (Bonnefoy, 1993, p. 101). There were many such stelae everywhere in the Kāthmāndu valley, and were used to decorate numerous sacred sites, especially on fountains and pools throughout entire cities. The royal bathing pool in Sundari Chowk Square at the palace in Patan (1670) has many such stelae, with unusual and complex iconography which sometimes can be confusing due to the era’s tendency toward religious syncretism. In spite of its beauty, this stela could not come from such a prestigious site, which was the object of royal munificence. Provenance: Private collection, UK, since the 1970s. • Bonnefoy, Yves (Ed. ), Asian Mythologies,. Chicago-London: Chicago University Press, 1993.